This is an interview that Clint Malarchuk did for ESPERANZA Hope Magazine. I’ve been looking for it and finally found it. It’s a brilliant interview. Very worth everyone’s time to read. The former hockey goalie shares his story on confronting his depression and anxiety. There was a time when the face mask Clint Malarchuk wore as protection against hurtling hockey pucks mirrored the façade he donned to get through the day. In a rough-and-tumble sport where players are valued for their “manly” ability to get physical and play aggressively, the award-winning goaltender became a master at hiding the inner turmoil of anxiety and depression. Over 14 years, Malarchuk tended the crease for the National Hockey League’s Quebec Nordiques, Washington Capitals, and Buffalo Sabres before finishing out his playing days with the Las Vegas Thunder of the International Hockey League. When he was out on the ice, immersed in a game, he was able to find some peace. Off the ice, not so much. “In the locker room, I was the easygoing clown of the team, yet inside, I felt like my brain was on fire,” he recalls. From puck drop to final whistle, Malarchuk was focused on “the save”—keeping the puck from entering the net. Nowadays “save” has a different interpretation for him—as in, keeping others who grapple with mental distress from feeling alone and hopeless. He’s a powerful role model for other men. When he speaks in public, Malarchuk tries to stress that depression isn’t just a “woman’s disease” and how important it is for men to confront their depression and seek out treatment. “I always knew I was physically tough, but I believed I was mentally weak until I started talking to other men and finding out how many of them also suffered from depression,” he says. At a recent event, Malarchuk recalls, he was approached by a father and his teenage son. Malarchuk told the young man something he wished someone had shared with him at an earlier age. Malarchuk, 53, details his own struggles in his new memoir, A Matter of Inches: How I Survived in the Crease and Beyond (titled The Crazy Game in Canada). Take that “survived” literally: In a horrifying 1989 incident—witnessed by a nation of TV viewers tuned in to a Buffalo Sabres game—Malarchuk nearly lost his life when a skate blade slashed his neck. The accident left Malarchuk with post-traumatic stress disorder—although it wasn’t diagnosed until years later—and deepened an emotional maelstrom that began during his difficult boyhood. He got a very different message then from the one he now promotes. “From childhood, I was taught to cowboy up and move on,” says Malarchuk, who was raised on a ranch in Edmonton, Alberta. His mask was already in place as he struggled through school and spent restless nights at the mercy of his anxiety and fear. “I remember thinking I was the only person on the planet who felt like their head was always spinning,” he says. When he was skating, hockey stick in hand, the spinning stopped. The ice was his refuge, and the ebb and flow of the game would override his troubled thoughts. Malarchuk threw himself into the sport—and into obsessive conditioning. He would run 12 to 20 miles each day, lift weights, and box. The “man up” message also drove Malarchuk to less healthy ways of coping: drinking heavily and erupting in anger. While medication didn’t erase all Malarchuk’s symptoms, it did serve to quiet his mind. He continued his hockey career as a goalie and, after hanging up his jersey in 1996, as a coach. Learning to manage his depression has been an ongoing enterprise. After a serious relapse in 2008, Malarchuk finally sought out talk therapy. He was challenged to face unresolved emotions related to his traumatic neck injury years earlier. “In therapy, I had to … cry, and to acknowledge my feelings,” he admits. He also learned more about overall mental wellness. “I’ve tried to change my habits and focus on staying in the right emotional, mental and spiritual state,” he says. Malarchuk relapsed again while writing his memoir, turning back to old coping methods as old anguish resurfaced. He was goaltender coach for the Calgary Flames at the time, and team administrators offered to send him to a treatment center. Part of the month-long rehab involved targeting the underlying causes of his alcohol use. Malarchuk says he learned more about tools like self-talk, personal time-outs, problem-solving and relaxation techniques. Last summer, Malarchuk began a new chapter in his life. He retired from hockey to live full-time on his ranch in Nevada, where he’s been raising emus for years. He is devoting himself to a second career as an equine chiropractor and dentist. Where playing hockey was once his escape, now the barn is Malarchuk’s refuge. His office is there, and a gym space where he lifts weights and works out every day he’s home. A father of three, with one teenage daughter still in the nest, Malarchuk tries to be open with his children about his depression. He recalls one occasion last winter when depressive symptoms arose and he began to cry. Instead of hiding away, he asked his daughter to come sit with him. “I asked if she had ever felt depressed, and I told her that no matter what she was going through, that she could always talk to me,” he explains. Malarchuk hopes he can be there for his own children the way his mom, Jean, has been there for him. 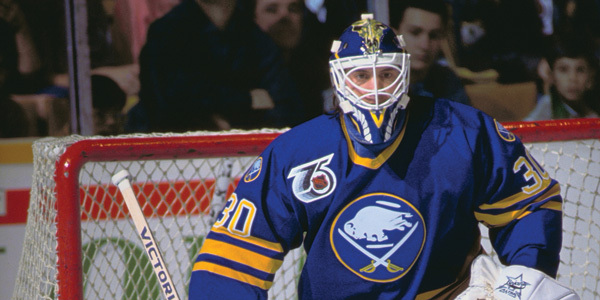 In the past, Malarchuk’s honesty has opened him up to attacks that he’s somehow weak. He’s heard taunts—“Hey, Malarchuk, pop another pill.” He recognizes that depression can be hard to understand for someone who hasn’t been through it. That’s partly why he’s so passionate about speaking out. By looking outward: Malarchuk has learned that focusing his energy on helping others is an antidote for his own depression, whether it’s caring for horses or answering e-mails from people who write him about their struggles. By looking beyond: When Malarchuk begins to feel anxious or depressed, he searches for the root cause. He was experiencing symptoms after a recent trip and determined that he hadn’t been sleeping enough while traveling. “I’ve learned that it’s important for me to get 8 to 10 hours of sleep each night in order to feel my best,” he notes.